From the comfort of having achieved a third consecutive world title, Kawasaki bets for sure for 2018 with Ninja ZX-10RR. In Kawasaki they know they have the pan caught by the handle. It is they who control the category of Superbike despite the continuous efforts of their rivals from Italy, Germany or Japan. From that privileged position, they do not need any kind of revolution to stand up and, precisely for that reason, by 2018 they will bet on the same configuration as in 2017. The Kawasaki Ninja ZX-10RR 2018, the most radical version of the Ninja family, some mechanics and, judging by its recent performance, does not seem to need it either. We can only distinguish 2017 from 2018 by the color of the air cylinders of the suspensions and the caps of the forks. Everything else is as it was. And it makes a lot of sense: Kawasaki now watches how Honda with the CBR 1000RR SP2 or Suzuki with the GSX-R1000R try to wrest control of it when Gixxer has yet to debut on SBK. Also Ducati, which leaves the two cylinders to present within a month its promising V4, although it would not be released in the world until 2019. Also BMW plans a first radical change in its S1000RR. With some machines yet to be set up and others that have not yet appeared, Kawasaki can bet calmly and safely on its 2018 Ninja ZX-10RR and in 2019-2020, we’ll see. It is the premise that Kawasaki has followed with his Ninja ZX-10RR 2018, the most radical version of the superbike of Akashi, a bike that has served as a basis for Jonathan Rea to add three consecutive WSBK world titles, the last in Magny -Cours a little more than a week ago. Looking ahead to 2018, the 2018 Ninja ZX-10RR will remain unchanged from this year’s model. The only modification is found in the colors of the bottles of air the hairpin, which change from red to gray, a change of color that we also find in the upper plugs of the hairpin. Once again, the 2018 Ninja ZX-10RR 2018 will be offered in a limited edition to 500 units, and will only be available with the Winter Edition finish. It incorporates Marchesini forged aluminum wheels with seven arms, lighter than the original, thus reducing the gyroscopic effect, and assembles Pirelli Supercorsa SP tires in measures 120/70 R17 and 190/55 R17. The engine is maintained as standard with the same power as the Ninja ZX-10R, 200 hp (210 hp with the ram-air fully operational), although it incorporates a new cylinder head ready to add a new racing camshaft can be ordered together with the Race Kit), as well as a reinforced crankshaft to withstand the usual power increase on a race bike. Another change with respect to the ZX-10R series is the new Kawasaki Quick Shifter, the semi-automatic shift, which now works both ways (up and down). 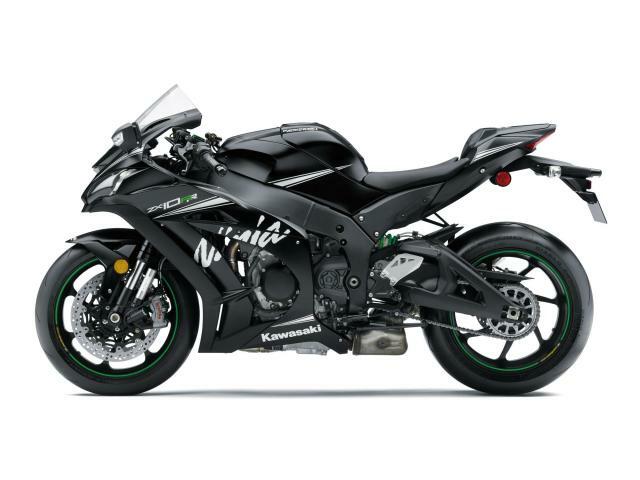 As for the price of this ZX-10RR 2018, at the moment Kawasaki has not provided more information, but should not vary much compared to the model 2017 (21.650 euros).